Okay let’s be honest. You might not think that the chicken nuggets from BK are awesome. Okay I can agree with you on that. They aren’t “awesome”. What they ARE is awesome-ly cheap right now. Ten for a buck-fifty? That’s stupid-crazy-cheap. Add to that, the fact that Mickey D’s is selling TWENTY nuggs for Five bucks? And after a long day of driving these are actually pretty tasty with some of my trusty-travel-hot-sauce added in the mix. Anyway…I am glad to see BK give the RODEO burger a push. Around here it’s always been available if you knew to ask for it. 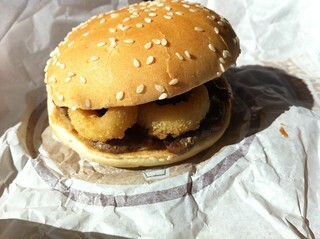 So now for a dollar you get a smaller (tell me I crazy) burger with some onion rings and BBQ sauce. I have always been a fan of this burger because the tastes just go so well together. Those strong onion rings and that slightly sweet BBQ sauce are just as prominent as the char-grill taste of the meat. This tastes like a back-yard cookout creation I might make at home. 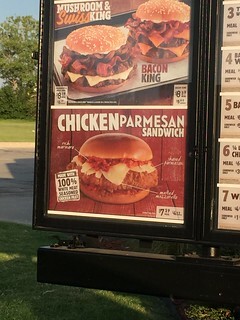 Along with the Rodeo Burger…they are rolling out a Rodeo Chicken sandwich…which I am reviewing later this week. I have often said nothing burps like bacon. That is still true…but good lord….Onion Rings are right up there. After polishing this off I had some sweet and vocal burps for about an hour. Probably a bit of an over-share as I re-read this…but oh well. We are all family, right? Anyway for a buck? Hell yeah go and scoop these up! Burger King is always sold out or is does not have available the new Frozen Lemonade quite often around these here parts. 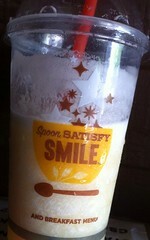 I finally got one and it’s pretty good in a slurpee-slushie type way. It’s your basic lemonde just more freezy like. I am sure you understand what I mean. Anyway I had half this sucker gone before I remembered I needed a pic for the website so what you see is a work-in-progress. I LOVE lemondade and that sweet-n-sour balance. This one from BK is a little more on the sweeter side than I would want but it’s still good on a hot day – like every day last week. Another summer release so expect it to be gone by the time I finish drinking this one here. Ah BK. How you miss the mark with this one. Buffalo Chicken strips sounded and looked SOOO good in the photo on the menu-board. Little did I know that you were simply going to take your regular tenders and toss them in sauce. Which would be fine if it was a great sauce. But this is a strangely bright and overly orange-colored sauce that is barely hot. 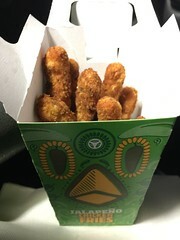 The chicken strips themselves are good when freshly made. These strips however….barely warm. The sauce coating them is lowering the temperature by the second. Five minutes down the road and they are stone cold. I had such high hopes for these. I was looking for another home run from the King. Instead I get a half-hearted attempt to create interesting. The idea was awesome. The execution was ham-handed. 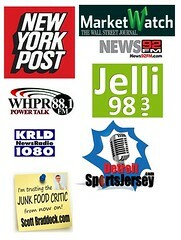 Categories Chicken, Drive-Thru, Taste Test, WINGS! Burger King has never been a place I think of when I think breakfast-on-the-go. They did have those “cini-minis” that I liked. Which if you read this often you know if I like something it will never last long. One Bacon, Egg, and Cheese and a Ham, Egg, and Cheese sammich to share. The bite I had of the ham-egg-cheese wasn’t that great. Ham was a little rubbery so one bite was all I could stand. 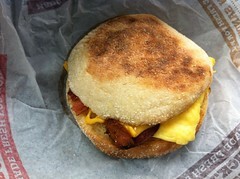 Mine on the other hand…bacon-egg-cheese was actually pretty good. The eggs were fluffy but I am not certain if they are some sort of egg-beaters or freshly made eggs. The bacon was smoky, crispy, and crunchy. The cheese was actually the dominate flavor of the whole thing. To be honest I am not up early enough to eat drive-thru breakfastes, but it’s nice to know I got a new option at BK. I wouldn’t get the ham…but that bacon sammich hit the spot!